New options for fighters, rangers, rogues, and warlords. 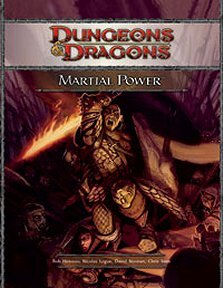 Publisher's blurb: "Martial Power is the first of a line of player-friendly supplements offering hundreds of new options for D&D characters. This tome focuses on the martial heroes: characters that rely on their combat talents and keen wits for survival. "This book provides new archetypal builds for the fighter, ranger, rogue, and warlord classes, including new character powers, feats, paragon paths, and epic destinies."